The undefeated Minnesota Vikings, that is right Packers roobs, undefeated, take on the Andrew Luck-led Indianapolis Colts on Sunday. Considering how handily the Colts were beaten in Chicago last week and the last second nature of the Vikings win over the Jags, this week presents a fork in the road for both teams. And I get it, yes, it is only Week Two. I am not going to go all Mel Gibson on you and freak out, but, for a young team, which both of these squads are, momentum is huge. This is it. Just ask the 2011 Cincinnati Bengals. That squad started 6 and 2 on their way to the AFC playoffs. Now, in case there was any confusion, neither of the sides in this match-up are expected to be playoff teams. But the level of their success this season will play a big role in the dreaded rebuilding process and it will hinge on that fickle mistress, momentum. The Vikings have it and need to keep it going. They have a certain swagger right now. Ponder looked the part and, even though it was the Jags, that swagger can be the difference in close match-ups. Vikings fans hope that the defense can contain wunderkid Luck in his home debut. The Bears destroyed the Colts in Chicago. They are looking for their momentum. 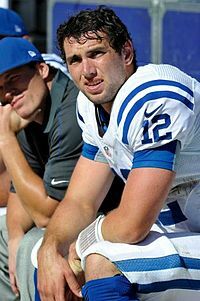 This week’s game is the Indy fans’ first opportunity to see number one overall pick, Andrew Luck. Considering the prime time debut of former fan obsession, Peyton Manning, this is a fan base in dire need of a new obsession. I mean, Jim Irsay’s Twitter feed is funny, but it is not that funny. Luck has the pedigree to fill Manning’s void. And even though they are still clearly in the honeymoon period, Luck has to deliver Ws to truly assume the mantle. I am sure he and the Colts think the Vikings present that opportunity. For the Vikings offense, a couple of important keys to watch for in this game are whether the Colts can pressure Christian Ponder or slow down the Vikings running game. The Colts are without stud DE, Dwight Freeney, but, the underrated Robert Mathis is still wreaking havoc — registering two sacks last week. The Vikings need to slow him down, chip him with backs and tight ends, to give Ponder time. The Bears’ running game grinded out 114 yards against the Colts on 33 carries, most of them in garbage time. AP, Toby, and Cheech should be able to top the total number in far less carries. Though Ponder’s success is clearly related to whether the Vikes’ running game has it going. On defense, the Vikings need to pressure Luck. They cannot let him get comfortable. The Bears had 3 sacks and 5 total hits on the QB. The Vikings need to replicate that pressure. Because the Colts running game is average at best, the Vikes should devote their resources to slowing down Luck. Mix-up the blitzes and coverage schemes. Do not let Luck get comfortable. That is when he gets dangerous. Both teams are looking to take another step forward. Maybe not getting to the next level, but showing improvement and confirming that the pieces are starting to fall into place. At this point in each team’s respective maturation process, the Vikings experience (including the gritty win last week) will be the difference. This entry was posted in Home, Vikes v. Pack and tagged All Day, Andrew Luck, AP, Bears, Bengals, Cheech Harvin, Chicago Bears, Christian Ponder, Cincinnati Bengals, Colts, Green Bay Packers, Indianapolis Colts, Kyle Rudlph, Kyle Rudolph, Minnesota Vikings, Packers, Robert Mathis, Toby, Toby Gearhardt, Vikes. Bookmark the permalink.